The French Navy order twenty Dewoitine D.373 fighters in 1935. A parasol wing fighter with fixed gear and an open cockpit, the 373 was a navalized version of the D. 371 that included an arrestor hook and flaps. Later, an improved version, the D.376, which had wings that folded back for carrier storage was ordered. 25 of these were built. 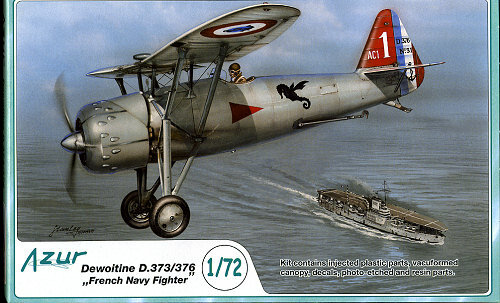 The aircraft were assigned to 7 C1 and 7 C3 Escadrilles. Like their army cousins, the 373/376 suffered from engine problems, mostly broken crankshafts. In Sept. 1939 the squadrons were redesignated AC1 and AC2 and quickly re-equipped with Potez 630s when Béarn deemed unfit for fleet combat service. 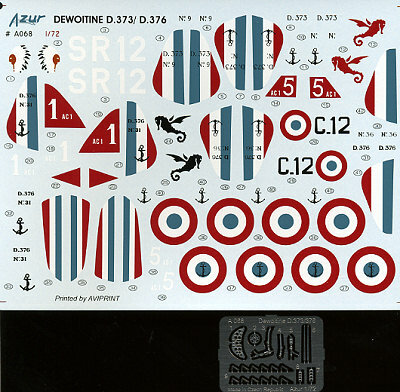 As this kit is derived from the D.371 fighter it is not surprising to find the same basic injected sprues. These are well molded and a bit flashy. There are a number of parts that will not be used when building this kit and those are noted on the instructions. 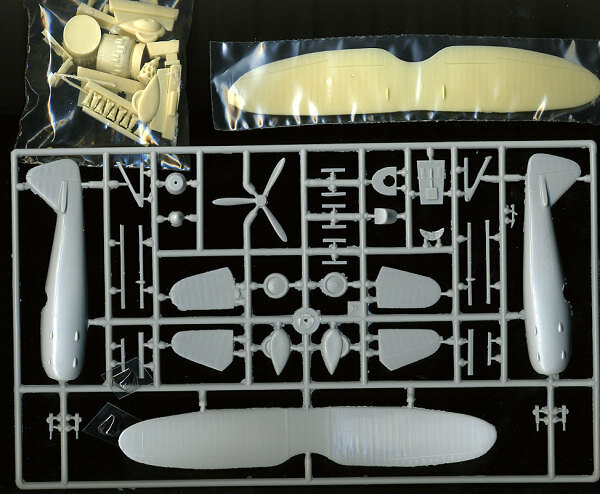 I was pleased to see that MPM/Azur/Special Hobby have taken a page from the Eduard book and are now packaging their kits in resealable poly bags. Much better way to do things as one can now keep all the bits in the bag that aren't being used during that part of the construction process. The kit also includes a lot of resin. The biggest is the new wing. This is a tad shorter than the plastic one provided and provides a few extra 'lumps' not on the injected plastic one. Same with other resin replacement bits like the spatted wheels. Resin is also used for the cockpit floor and side walls, the two engine cowlings, tail hook and engine. The 14 cylinder engine is to be built up with a block and separate cylinders. The engine cowlings are very nicely molded, however, one of mine is so thin in the front that you can clearly see through it. I'm sure it will break off there when sawing it off the pour stub. Reinforcing it with superglue prior to removal should take care of that. The photo etch fret includes the instrument panel, harness, a bunch of hinges and some other small cockpit bits. Two vacuformed windscreens are also provided. I should mention that the prop blades are all a single construct and I'm quite pleased about this as I despise individual blades/hub. Instructions are well done and provide a number of 'infoViews' to help with aligning the rather complex strut system used by this aircraft. Some small strut pieces will need to be made from stretched sprue and others will need to be trimmed if using the spatted wheels. Apparently there was not any standardization regarding these and it is nice to have the option of using them or not. The color callouts are with Gunze paints, obviously switched from Humbrol following that company's entrance into receivership. Perhaps this will revert back at a later date. Any difference in colors regarding the markings options is clearly noted. A rigging diagram is also provided. Markings are provided for four options, all in light grey. There are two options for AC 1 as shown on the box art, one for the Test Flight squadron, and one for the Fighter School. All the other options are shown on the back of the box in full color. If this is a permanent change to how MPM and company are doing their boxes, I approve. The sheet is very nicely done and provided the option for you to paint on the tri-color by giving the data information separate. Again, a great idea that only enhances the value of this kit. This is really a fine kit. It offers the chance to build a little known pre-war aircraft and a naval one at that. Though getting the struts set up and rigged properly might put off some, the end result is sure to be a really neat model. I also applaud the MPM company for making the improvements in packaging and hope this continues.